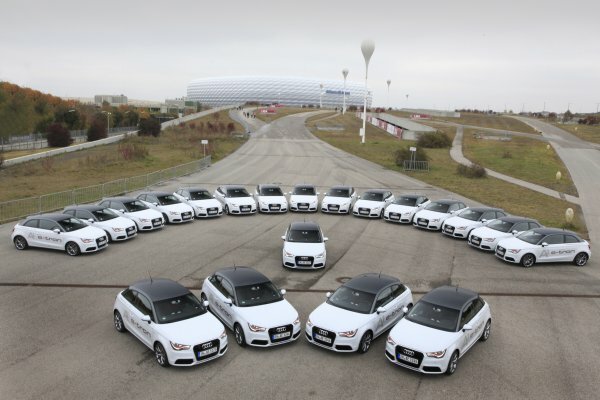 As of today, 20 units of the Audi A1 e-tron are on the roads of the Munich pilot region. Some trial participants even got the keys to their electric cars weeks ago. Audi, E.ON, the public utility Stadtwerke München and Technische Universität München (TUM) are project partners in this fleet trial. E.ON and SWM are in charge of expanding and maintaining the charging infrastructure in the Munich metropolitan area. As a symbolic gesture, Audi handed over the A1 e-tron fleet vehicles today to its project partners and trial participants. E.ON and SWM have installed a demand-oriented charging infrastructure; SWM within the Bavarian capital’s city limits and E.ON primarily in outlying areas. All electric fueling stations offer power generated via renewable energies. This fleet trial is part of the "Modellregion Elektromobilität München" (Electric Mobility in Munich as a Pilot Region) project, sponsored by Germany’s Federal Ministry of Transport, Building and Urban Development. The Ministry is providing the region with some ten million euros for electric mobility. This project will address a number of issues, ranging from the power grid itself to data transfer between drivers, vehicles, and electric fueling stations. For example, the use of a smartphone as a driver’s main interface will be examined. "Audi works relentlessly on comprehensive approaches which maximize benefits to customers. In this era of electric mobility, we will offer our customers a wide range of services which go beyond driving itself. For example, the networking of vehicles with their surroundings and with infrastructure as well as new concepts of mobility will be important," emphasizes Franciscus van Meel, Head of Electric Mobility Strategy at AUDI AG. He adds: "We want to use this fleet trial to learn more about our customers’ usage of electric cars, and their expectations in this regard. We are planning additional fleet endeavors in strategically important markets." The Audi A1 e-tron is an electric car with a range extender. Its output of 75 kW (102 hp) enables the A1 e-tron to reach a top speed of 130 km/h (80.78 mph). If the battery runs out of energy, then a compact combustion engine – the range extender – recharges the battery as needed to boost the vehicle’s operating range to as much as 250 km (155 miles). This compact electric car is a zero-emissions vehicle for the first 50 kilometers (31 miles) of a trip – in city traffic, for instance. The battery comprises a package of lithium-ion modules mounted in the floor assembly in front of the rear axle. In short, the four-seat A1 e-tron was designed for daily driving in metropolitan areas. It consumes a mere 1.9 l/100 km (123.80 US mpg), for a CO2 equivalent of just 45 g/km (72.42 g/mile)*. As Ruth Werhahn, Head of Electric Mobility at E.ON AG, emphasizes: "The fleet trial which started today will only add to the expertise we have been acquiring during more than ten pilot projects for electric mobility in six European countries. We have blazed new trails in the charging infrastructure. We have set up not only public charging points near large cities but also innovative charging points at multi-level parking lots in city centers. Drivers simply insert their parking-lot tickets to use the charging points and then pay for their electricity along with the parking fee." E.ON has already developed commercially viable charging solutions for various scenarios. For example, the company markets a package to private individuals in Germany: green power and a charging box for use at home. But E.ON first conducts a safety inspection of these customers’ electrical equipment. After all, not every electrical outlet and its wiring is designed to withstand the heavy loads associated with recharging an electric vehicle for hours. E.ON also supplies charging stations open to the general public – primarily commercial customers. At these stations, two electric cars can recharge their batteries at the same time via different charging points. Magnetic-stripe cards grant drivers access. Both types of electric fueling stations are being used in the Munich fleet trial. In addition, E.ON is fostering the continuous enhancement of charging technology by focusing on direct-current (DC) fast charging as well as cable-free charging. Dr. Florian Bieberbach, Commercial Director at SWM: "We have been working with partners for quite some time on various projects concerning individual electric mobility. As the operator of streetcars and subway trains, we have more than 115 years of electric-mobility experience in public transportation. SWM is responsible for the charging infrastructure within Munich city limits; we also offer the green power which facilitates CO2-neutral driving. The foundation for this was laid by our Renewable Energies expansion campaign. We want to generate enough green electricity by 2025 to supply the entire Munich metro area with electricity. Munich is thus on pace to become the world’s first city of a million-plus inhabitants to achieve this ambitious goal." TUM is collecting and analyzing data on people’s mobility during the project. In which situations do people drive electric cars and to what degree? And how will this technology influence the use of other means of transportation? To answer these questions, the departments of Automotive Engineering and of Ergonomics have developed a mobile application that all fleet-trial participants can use on their smartphones. More specifically, these devices will thoroughly document participants’ mobility behavior – from their use of bicycles through electric cars and combustion-engine passenger vehicles to buses and trains. At the same time, the Department of Services Marketing is conducting a study to ascertain suitable models for billing electric-mobility customers. "For researchers, it is no longer a question of whether electric mobility will catch on, but rather when. Electric mobility constitutes a paradigm shift for companies and society alike. This fleet trial allows us to learn more about people’s mobility habits under a new set of circumstances," says Professor Markus Lienkamp at TU Munich’s Department of Automotive Engineering. "Insights from this project can then serve as the basis for worthy approaches to sustainable individual mobility."